For Syrian Refugees In Connecticut, A Helping Hand From Private Volunteers : Parallels Refugees are adjusting to life in Connecticut, where a program pairs them with private citizens who provide support for their resettlement. "I have a chance as much as anybody else," says one refugee. 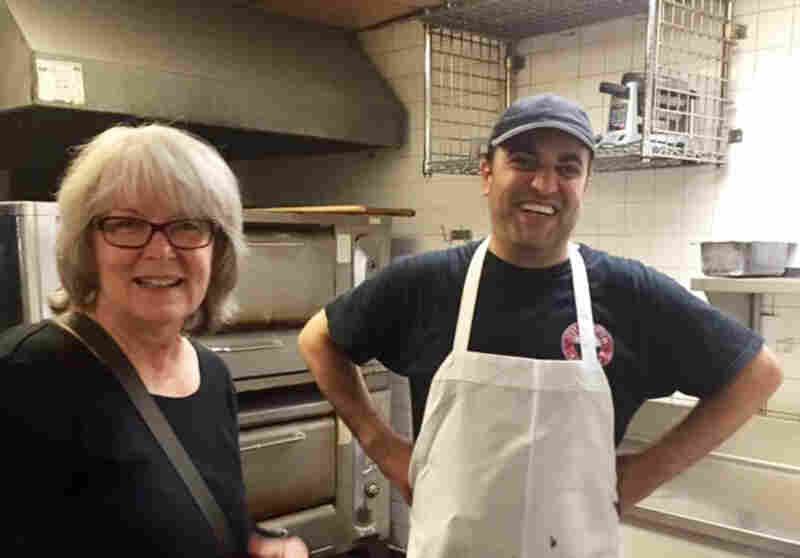 Marsha Lewis, a semi-retired teacher, is one of the volunteers helping Syrian refugee Fadi al-Asmi, standing in the kitchen of Hartford's City Steam Brewery. Asmi, who co-owned a pastry shop in Damascus, now makes desserts at this Hartford cafe. Fadi al-Asmi has learned to adjust his Syrian pastries to American tastes at the City Steam Brewery café in downtown Hartford, Connecticut. "America, chocolate!" he says, as he adjusts his baseball cap and serves his latest chocolate-encrusted confection. It's not the only thing he's learned since he and his family were catapulted into a new life after arriving as refugees in May. There's a beautiful system in America compared to Syria, Asmi explains through an interpreter. "Over there, the big guys eat the little guys," he says. "Here, I feel that the little guys have a chance to rise up and become a big guy, without eating the little guy." Asmi is a refugee from Damascus, where he co-owned a pastry shop. He lost his home and business in a war that forced this father of three to flee Syria with his family in 2012. His skills landed him a job at the cafe in Hartford, where he's absorbing a new culture. "It's the thing that surprised me the most," he says about his new home. "I have a chance as much as anybody else." Asmi has come a long way quickly, and that's mostly because of a program in Connecticut in which private citizens can sign up to directly help refugees start new lives. Some 5 million Syrians have fled since the war began in 2011. The U.S., which took in only about 2,000 refugees in the first several years of the war, has increased the number to about 12,000 this year. The federal resettlement program is administered via nine agencies that depend on the work of volunteers. Barbara Howe, a retired culinary instructor, is a core member of a group supporting Asmi and his family. "You have to have these very specific things," she explains about the program's requirements. "You need people in housing, you need to have people in finance, you need to have a meal when they get here." Richard Groothuis, a retired lawyer, helps the team wade through legal requirements of the federal refugee resettlement program. Marsha Lewis, a semi-retired teacher, often accompanies the family on medical checkups. Team leader David Hager, a retired cardiologist, assigns tasks each week to the core group, as well as larger pool of volunteers. The team came together a year ago, strangers eager to embark on their first refugee resettlement. Now they are close-knit, with close ties to the Asmi family. "Their independence is something we all want," says Hager. That is the goal of the U.S. resettlement program, but he insists the friendship with the family will endure. "The relationships are the central motivating, endearing thing about the project." Connecticut community groups like the one Hager leads have resettled 28 Syrian families across the state — more than 150 refugees total. Chris George created the Connecticut program and heads Integrated Refugee and Immigration Services (IRIS), a nonprofit contracted by the State Department to resettle refugees. "They do virtually everything," George says of the community groups. "Because they've been trained by us, they will sit down with the family and go over all the things they are going to do together." More than 50 groups in Connecticut have signed on, says George. They include members of various faith communities, even the head of a car dealership. "Why should churches have all the fun?" George jokes, as he aims for a wider pool of volunteers around the state. Controversy over Syrian refugees has spurred interest and allowed IRIS to double the number of refugees served in Connecticut this year. He expects the number of resettlement cases to rise next year. Back at the café, Hager points to a specific event that compelled him to get involved in resettling refugees. In November 2015, Connecticut Gov. Dannel Malloy welcomed a Syrian family after Indiana officials rejected plans for Syrian refugees to resettle in their state. "The officials in Indianapolis said, 'No, you will not come here!'" says Hager, his voice rising as he recounts his anger over news stories of a Syrian couple and their five-year-old son who had been waiting for three years to resettle in the U.S. The Indiana rejection stoked a backlash in Connecticut. "I think that probably did more for the refugee resettlement program in Connecticut than anything the official people in Indiana can imagine," Hager says. The U.S. refugee resettlement program historically has relied heavily on faith-based communities and other private groups across the country for support. "The current U.S. system is very much a public-private partnership," says Anne Richard, Assistant Secretary of State for Population, Refugees and Migration. The Connecticut model developed by IRIS is similar in some ways to a Reagan-era program that lasted from 1987 to 1993, says Matthew La Corte, an immigration policy analyst at the Niskanen Center in Washington. It was a federal initiative in which private, sponsoring organizations agreed to provide for basic needs until a refugee became self-sufficient, he says, "resettling 16,000 mostly Cuban and Soviet Jewish refugees all through private money. We've seen this has worked in the past." Syrian refugee Hani Hamou works as a dishwasher at the Fresh Salt restaurant in Old Saybrook, Conn. Recent interest in the Syrian refugee crisis has revived this idea, says the State Department's Richard. "We are open to a pilot program. We don't have enough time in the Obama administration to design and introduce a private sponsorship program in the U.S., but it could be done in this  fiscal year." Meanwhile, in Connecticut, George drives around the state to promote the program. His makes this case to Connecticut residents: "It's happening in their own backyards," he says, "and they can have a role in it. What other foreign policy program would people be able to actually participate in?" 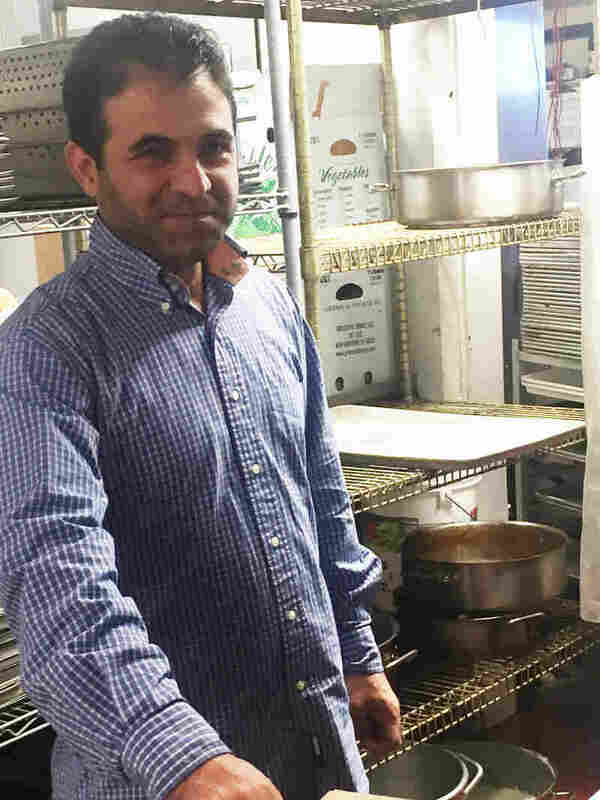 In the kitchen of the Fresh Salt restaurant in Old Saybrook, on the Connecticut waterfront, Syrian refugee Hani Hamou is in charge of loading dirty pots into a dishwasher. It's an entry-level job, his first in America. Hamou, an educated professional, was a maître d' at an upscale restaurant in Aleppo before he fled the country with his family in 2013. He got his current job with the help of a co-sponsor group from the First Congregational Church of Old Lyme. Syrians who resettle in America don't have it easy. In fact, it's not easy for any refugee in the U.S. resettlement program, which requires financial independence within six to nine months — when housing assistance runs out. Casting a shadow over Syrian resettlement is the national political backlash. Most U.S. governors say they want to ban Syrian refugees from resettling in their states. Rev. Steven Jungkeit of Old Lyme's First Congregational Church has heard objections in his own Connecticut church, even as he has grown close to the Hamou family, sharing meals and learning traditional Syrian music and dance steps. "I got a little note one time saying that we wanted to bring terrorists over," says the young minister. Still, he's convinced that an evening spent with the Hanou family would transform even the staunchest opponents. "After an evening like that, they would say, 'There is less to fear then I thought,'" he says. "It enlarges the space of the heart."